Mattress toppers are a perfect way to add an extra layer of comfort to your bed. Our toppers come in a range of high quality fillings, each one guaranteed to make you nights sleep a whole lot more comfier! Each of these toppers is made to fit 6'6" and 7' wide beds. (Emperor or Large emperor) we offer a range of lengths for the topper but if you can't find your size don't worry. Please call 01706 220020 or contact us for a quote. 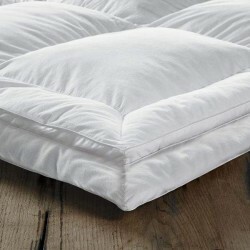 Emperor Mattress Topper Duck Feather & 100% Down Combination.5cm Duck Feather & Down topper .. Luxury Emperor Topper - Duck FeatherTopper to fit 6ft 6in and 7ft beds.Soft, supportive topper that ..
Emperor Topper - Hollow FibreTopper to fit 6ft 6 and 7ft bedsFilled in soft, down like Dacron Comfor..